My kids and I just finished making a tomten garland for our annual Swedish themed Christmas celebration and so I figured a list of tomten books was in order. 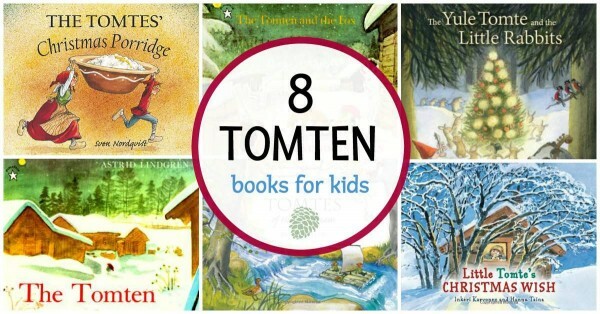 We were inspired by Astrid Lindgren’s famous book, The Tomten, but being the book nerd that I am, I couldn’t leave you with just one book suggestion! No, no no! The Tomten. You cannot go wrong with this splendid classic; it’s a book that should be on every child’s bookshelf. Across Scandinavia, gnome-like creatures called tomten watch over farms while the humans sleep. They are quiet and strong and talk to the animals, comforting them during the cold winter nights. The Tomten and the Fox. A solitary fox is hungry and the hens look tasty. The watchful, protective farm tomten shares his dinner with the hungry creature in this gentle companion book to The Tomten. The Tomtes’ Christmas Porridge. Contemporary Swedish writer Sven Norquist penned this funny little story about a tomte family who looks forward to the rice pudding their master gives them at Christmastime. The Yule Tomte and the Little Rabbits: A Christmas Story for Advent. This books is separated into 24 short chapters, with marvelous illustrations. One story is read on each day of advent. Grump the tomte is waiting for Yule (Christmas) when all of a sudden a wind blows his mittens and hat away and into the hands of a couple of rabbits. The rabbits are delighted with their strange gifts but the tomte worries he won’t be able to bring Christmas to the forest without the necessary garments. A wonderfully delightful story. We have just begun our second annual reading of the book. Also available: The Midsummer Tomte and the Little Rabbits. Little Tomte’s Christmas Wish. Little Tomte is worried that Christmas won’t come this winter. He comes up with a special way to prepare, making candles and lighting the forest up in a magical way. The pictures in this one are especially fun to look through. Winterfrost. (chapter book/novel) When I heard about this book last year I could not contain my excitement. An entire novel about nisser! A nisse is the Danish version of tomte. Families are supposed to leave the nisse a traditional bowl of Christmas pudding on the eve of the holiday, but this year, Bettina’s family is beset by troubles and they forget the pudding. In a fit of mischief, the local nisse, Klakke, steals the family baby! Bettina sets out into the woods to find her sister and encounters more mythological creatures and adventure in this tale of magic and kindness. Break out the pepparkakor because you will love this story. Hedgie’s Surprise. Set in the summertime, the mischievous Tomten keeps stealing the hen’s egg. Hedgie the hedgehog concocts an elaborate plot to finally convince Tomten to instead be satisfied with the porridge his mother makes. The Tomtes of Hilltop Farm. 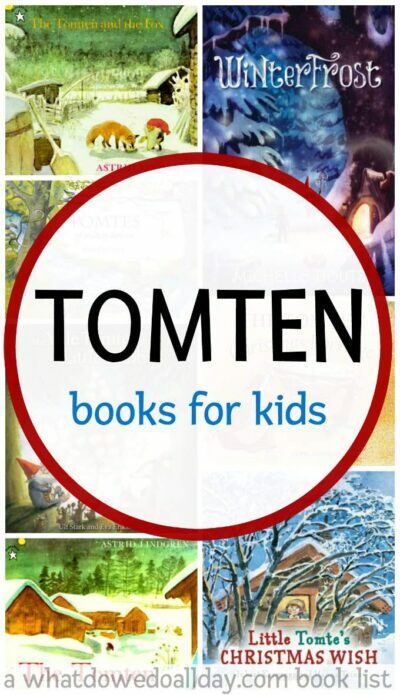 There are several books about the tomten (it’s not “tomtes”!) of Hilltop. In this one, Farmer Robinson has trouble with naughty farm animals and failing crops and has to put his farm up for sale. Children, Emily and Jamie and ask the local tomten to help them save the farm. Are you confused by the words, tomte, tomten and tomtes? When translators or English speaking authors use the word, there seems to be no rule. In Swedish, tomte is singular and tomten in plural. We publish a new book list every Monday! Sign up for our newsletter and never miss another list of the best books for your kids. We just finished reading Winterfrost and loved, loved, loved it. It’s right up there with House on Pooh Corner and The Penderwicks for our family! Thank you for the recommendation! Yay! Such a great book. I’m so glad you enjoyed it.